At H&H, we not only can drill your well and install your pump system, but we can also treat your water, to give you the cleanest and best tasting water possible. We have teamed up with Hague Quality Water, a family owned water treatment supplier with over 50 years of experience in the water treatment industry. Over 60% of our body is made of water. It is very important that we consume clean and pure water. We use water for cooking, cleaning, bathing, and even drinking. Having clean and safe water will make life for you and your family much healthier. Bad water can cause major problems with your homes plumbing and appliances. Hard water and calcium buildup can shorten the length or your hot water heater by years. Hard water will slowly eat away at your plumbing and any appliance that water goes through. It can also leave unwanted stains in your sinks or showers and put frustrating water spots on your clean dishes. This is where we would recommend our Hydro Clean or Watermax 62 AMQ to solve your problem. Another common water problem is iron. Iron in water can also stain everything it touches. It leaves an orange or rusty tint on everything it touches. It will even discolor your clean white laundry. The solution to iron would be a HC3 2IF iron filter or Watermax 62 AMQ softener/iron filter. If you have a rotten egg smell in your water there is a good chance that hydrogen sulfide or sulfur is present. This smell can be unbearable at times and makes using your water almost impossible. This is when we put the power of the Watermax 62 APQ to perfect use. 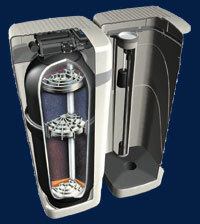 This unit will remove those foul odors give you good, clean water. Most people believe that since I live in the city and have public water, I do not have to worry about treating the water because the city does it for me. This could not be further from the truth. The city does kill bacteria that could be in the water; however they do this by dumping chlorine into the water supply. Chlorine is not only bad to consume, but it is bad on your skin and clothing as well. Would you go to your local swimming pool and take a drink straight from the pool? If you answer is no, then we have a unit to remove the chlorine from your water. The answer to chlorine removal is our Watermax 62 BEQ. 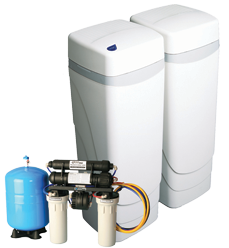 This unit has a special carbon designed to remove chlorine from the water, leaving you with clean water. No matter which of these problems you suffer from, we have treatment option for you. With a complete line of Water Softeners, Iron Filters, Reverse Osmosis Systems, and UV lights, we can take nearly any unpleasantness out of your water, leaving you with clean, safe, and good tasting water out of your tap. Call us today for a free water analysis with one of our certified consultants to make sure your water chemistry is within our treatable parameters.